In the winter of 1705, a young organist set off to walk from Arnstadt to Lübeck to visit the organist and composer Dieterich Buxtehude. This 250-mile journey was to become pivotal for this teacher and as yet unknown composer, Johann Sebastian Bach. He had got permission for four weeks leave, but his visit ended up taking more than four months which upset his current employers at New Church, Arnstadt. It wasn’t a pilgrimage in the usual sense, rather he was continuing the long tradition of being a wandering scholar. He would pass through a series of cities, duchies and mini-states, would be a transformative moment in his career. Three centuries later Horatio Clare set off on the same journey, to follow in his footsteps immerse himself in the landscape and perhaps gain some insight and understanding to the great man. Clare was not alone like Bach though, nor was he armed like Bach almost certainly was, instead, he was accompanied by Richard who was recording the journey and Lindsey who was producing it for BBC Radio 3. It is though a sky cannot be quite large enough to contain the gentle venerations of the cello. Some of the noises that they encounter would have been the same as Bach encountered on his walk, the burble of the river, bird calls and songs and the wind rustling through the trees, but compared to those days when working on the land was essential to survival, they encounter almost no one on parts of their walk. There would be no drone of traffic, rather Bach would have heard the squeak of cartwheels behind the heavy breathing of horses. As Clare emerges from the paths into the cities, he knows he is treading the same cobbles that Bach will have walked upon too. The sun goes down leaving a crimson scripts and a huge flourish of flared cloud above pine forestry. Clare’s describes his walk as being close on the heels of Bach’s ghost, and as they arrive in Lubeck the anticipation is electric. Entering the church send shivers up his spine, It is not the same building, having been rebuilt after World War 2, but Bach’s still presence permeates the space. There is something deeper going on here too, the music that Bach wrote stemmed from what he learnt and mastered here in the freedom that Lübeck allowed. 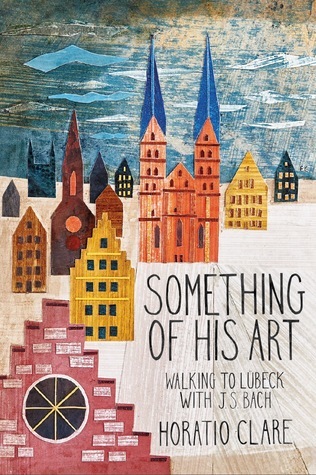 Something of his Art is a well researched and passionate about its subject, however, it is the quality of Clare’s writing and his keen eye describing the places they walk through make this a special book to read.